Make no mistake, Massman is in acquisition mode. But Jeff Bigger, CEO and president, isn’t in any hurry. In an industry composed largely of family-built OEMs doing less than, say, $20 million in revenue annually, private equity groups (PEGs) often get a bad name. And some of that is earned. There are more than a few cautionary tales of private equity’s perceived propensity to buy, lean out, then sell a business that may have been someone’s life’s work. That said, in today’s machine builder environment, there are undeniable advantages of scale that PEGs can offer OEM owners in strategically growing their business. With PEGs’ deep pockets at the ready, OEMs can potentially become strategic buyers themselves, adding both scale and robustness in line solutions that reach further up and down the value chain. Walking the PEG tightrope, Jeff Bigger, president and CEO, Massman Automation Designs, knew that to stay competitive, he had to start piecing together strategic pieces outside of his company’s original case packing core competency. Brands Massman has purchased included Midmac in 2005, adding a filter assembly division. It acquired Sabel Engineering in 2008, adding bottom load and robotic case packing, then Talon Manufacturing in 2010, adding microwave popcorn packaging and flex pouch packaging lines. 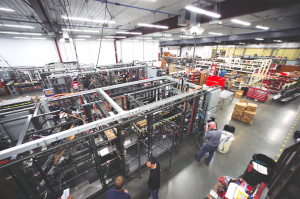 In 2012, it acquired Packaging Systems Automation for expanded cartoning and material handling, plus PASE Group, a liquid filler that became its first off-site, stand-alone company. In 2013, it purchased Bedford Technology®’s packaging equipment division for reclosable packaging solutions. In early 2016, Elliott Manufacturing was acquired, adding case erecting and case sealing. Massman completed all these acquisitions with its own internal resources but found the time might be right to find a strong partner to continue the growth. A new 2016 partnership with Granite Equity Partners changed the game in terms of acquisitions. Granite Equity is a local Minnesota private equity group with a stated commitment to the long haul. The 100-year horizon has made a big difference in Massman’s acquisition plans, and doors began opening more readily than they had before. 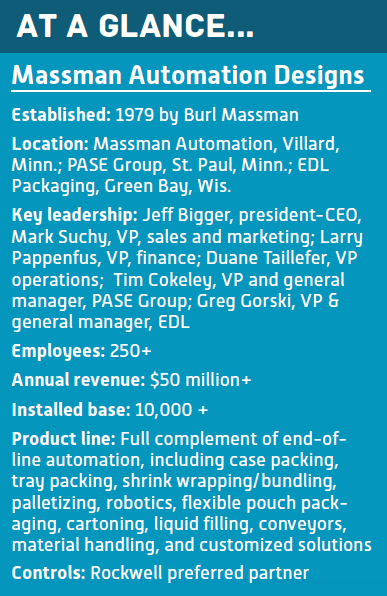 In 2016, Massman acquired EDL Packaging Engineers, adding shrink wrapping and bundling. Located in Green Bay, Wis., EDL has been Massman’s largest acquisition to date and was completed with the help of Granite Equity. The company will remain a stand-alone facility poised to grow in Green Bay. Plus, according to Bigger, the pocket of technical competency around a good product line really can’t move without the product declining. “You have to leave those people where they are. EDL has been a good example. And knowing what I know about Granite Equity Partners allows me to honestly say to a potential acquisition, ‘Anybody that’s interested in selling their companies and want their brand to stay, want their people to stay and their company to stay in their environments, that’s what we do.’ The only way we can be successful together is by partnering with other companies—even if it’s short of the acquisition concept. We’re looking to partner with companies in a consolidating industry because it takes strength in numbers,” Bigger says. As has been learned and demonstrated elsewhere in the industry, it’s best for the buyer in an acquisition to avoid tinkering with the “secret sauce,” or whatever made the acquired OEM successful. While this usually involves the technical competency closest to assembly and engineering, it doesn’t always end there. PASE Group, which specializes in fillers, has long held a distribution relationship with Mettler Toledo; in fact, PASE fillers are branded as Mettler Toledo to be incorporated into that company’s full lines. While there are no two identical PASE fillers, they do have to keep things relatively modular in the form of more standard models for easy distribution and shorter lead times. So while Massman sells through direct sales and a network of independent reps, PASE has a baked-in distributor relationship with Mettler Toledo. Another example of divergent approaches might be Massman’s unique use of its assembly team for everything from FATs and SATs to aftermarket service and support. Meanwhile, PASE and EDL use more traditional devoted service and support teams. Those unique approaches may be shared and exported, or they may remain intrinsic to each specific brand or company. Practices are evaluated on their own merits, and decisions tend to be made at the company level rather than dictated from the top. “For us, the secret to success has been over-communicating. It’s key to find a collaborative tool that knocks down walls and removes silos to help us all make better decisions,” Cokeley says. For PASE, that tool has been the Smartsheet platform, a spreadsheet-style interface used to assign tasks, track project progress, manage calendars, and share documents. 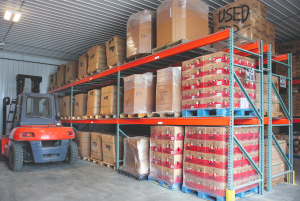 Meanwhile, the Villard facility is implementing an all new ERP system—no small project. Whether that ERP will immediately or eventually migrate into all of the Massman companies remains to be seen. But the greater plan is for the simple sharing of ideas, and for the best ideas to rise to the surface and be shared. “We’re very much trying to plagiarize from each other,” Cokeley says. Granite and the Massman management team, which consists of Bigger, Suchy, Pappenfus, Taillefer, Gorski, and Cokeley, has emphasized the importance of the success of employees in the workplace, especially when the time horizon is shifted to the long term. Acquisitions present a challenge to the sales and marketing teams to figure out the best way to leverage sales channels, and how the company appears to its customers and the industry. As it moves toward a more coherent look, including having all companies in the same trade show space, Massman has updated logos and websites. Also, it performs monthly sales meetings sharing best practices and leads across companies. All of this intends to educate its sales teams on all of the product lines, to foster cross-selling, and ultimately, to give customers a broader product offering. Bigger describes benefits at Massman, meaning the entire package of salary, retirement, health/wellness programs, and insurance, as striving to be world class. The company is beginning to focus on personal development programs to add to the improving benefits package. Building such programs also serves a less altruistic purpose. 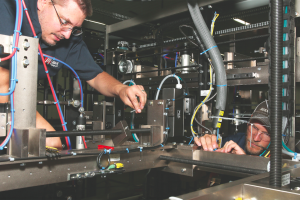 Alexandria, Minn. is a regional hotbed of packaging OEMs, so the local manufacturing workforce can be selective and recruiting is highly competitive. So for Massman, a focus on wellbeing of its people is simply practical. With ample room to grow, Massman built a storage facility primarily to accommodate requisite materials for FATs. The company also has a 200-sq.-ft. refrigerator-freezer, placed on a frame with fork truck pockets, to accommodate frozen product and accurately depict its handling during FATs. And with the skids, the company can take the freezer to the machine on the floor. Currently at 100,000 sq. ft., the Villard Massman facility has plenty of room to grow, and Bigger thinks that’s only a matter of time before it does. 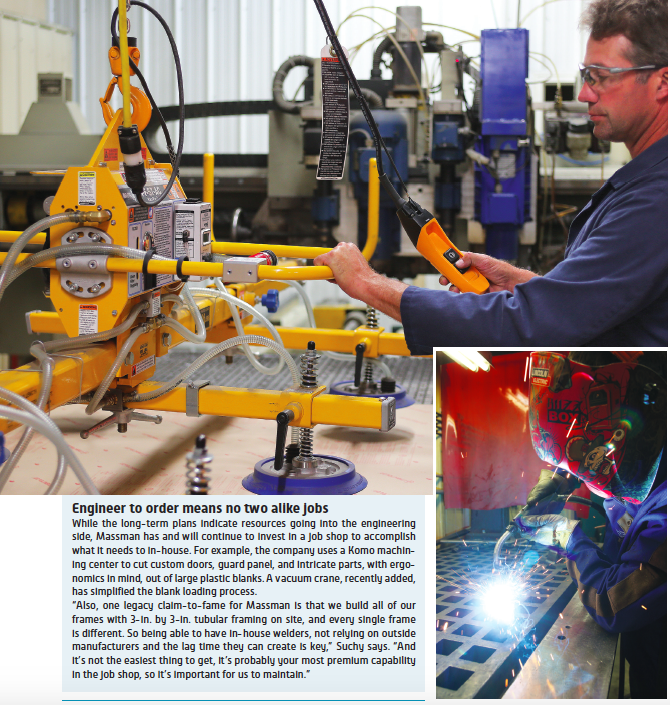 The facility has full welding, milling, fabrication, and typical job shop capabilities. A second leased location, 10 miles to the southwest in Glenwood, Minn., is outfitted with all new CNC machines. Those machines could end up in Villard at some point, but the specific location of the Glenwood shop serves to attract a trove of machining talent south of Villard. Those folks would otherwise have to travel 20 miles further north to comparatively-bustling Alexandria, to find a machine builder. So, the off-site location acts as a strategic advantage when selecting from a thin workforce. Still, while the blocking and tackling of machining and fabrication will always be a cornerstone of Massman, Bigger sees a long-term focus-shift more toward innovation across the company, whether that’s in operations or, most importantly, engineering. As part of Massman’s plan to focus energy into engineering-rich areas of creativity, innovation, and intellectual property, the company is experimenting with co-engineering and co-innovating machines with its customers. In the past, an OEM would be forced to commit to developing a brand-new technology for a customer, but that customer might only be in the market for one machine, and that’s only if it works. “Now, using the co-engineering model, we’re saying, ‘Why don’t we partner on the first machine and see if this can happen?’ Because if it can happen, now our customer has a competitive, first mover’s advantage,” Bigger says. A generalized example of this might be found in the move from cartons to flexibles. The largest food and beverage companies are probably not as quick to innovate as a small entrepreneur running a small food company. This is just because it’s hard to turn the proverbial aircraft carrier in making the move from a traditionally cartoned product to an individually wrapped, single-dose sized product filling a flexible pouch. “But the large companies are catching up, and when they catch up, they want to do it in a really big way. And when they want to do it in a really big way, they need to partner with one company, do it right, get it through R&D, get it accomplished, keep it proprietary, and beat the market,” he says. 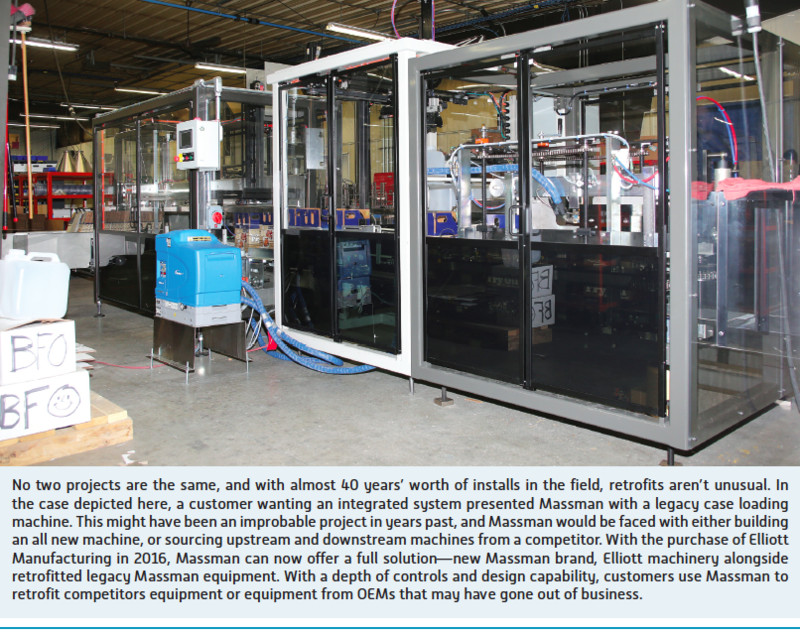 At Massman’s primary Villard facility, shop-floor flow is lean and becoming leaner. The company is in the process of “flexing its lean muscle,” Bigger likes to say. Engineering develops the CAD designs, which are sent to a centralized tower in the machine shop. The raw materials are either taken from inventory or ordered from the tower. When they arrive, the materials meet the designs or prints, either at a machine or in the fabrication and welding center. Most parts are machined in house, either at the Villard facility or at the machine shop in Glenwood, but occasionally parts need to be outsourced in the case of a special operation. Finished parts are boxed and sent out for painting, plating, or other necessary secondary operations. Parts come back from the powder coating and platers, are carted, and then go to cellular assembly centers, complete with Vendor Managed Inventory (VMI) racks and other lean techniques.